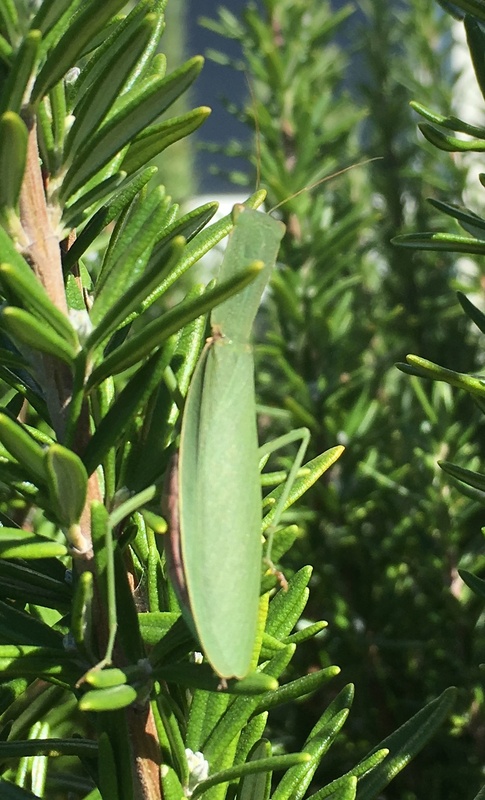 Back in early December last year, I posted an update on the preying mantids on my rosemary bushes that I’ve been following since mid-winter, when they were eggs. Well, I haven’t forgotten them, and I’m pleased to report that they are all grown up now, and laying eggs of their own. On the one hand, I’m thrilled (as I am every year) to watch the entire life cycle play out in the garden. On the other hand, I’m getting a little worried. Last winter, I didn’t prune the rosemary bushes because the bees depend on their flowers in late winter. Then in the spring I couldn’t prune them because the preying mantids hatched out. All summer I waited and watched the mantids grow. The rosemary plants grew, too, engulfing a bench on one side, and the path on the other. We may soon see just how big rosemary can grow here.